...there was a time, five or six hundred years ago, when melancholy was identified with the Roman god Saturn. To be melancholic was to be in Saturn, and a person chronically disposed to melancholy was known as a child of Saturn. Saturn was also identified with the metal lead, giving the soul weight and density, allowing the light, airy elements to coalesce. Traditionally there is a binding theme in Saturnine moods. In May of this year, upon the release of the trio Mohammad’s second record, Spiriti, I referred to this triple-vinyl sound-sprawl on a music forum as lugubrious joy. Antifrost label owner and Mohammad member, ILIOS, affirmed my paradoxical descriptor. Continuing to plumb the sonic materials of their 2010 debut album, Roto Vildblomma, Mohammad’s low-end basin brims with Nikos Veliotis’ cello, Coti K’s contrabass, and ILIOS’ oscillators – brims and overflows into headstreams that roil and growl at frequencies more felt than heard. Lugubrious will be immediately apparent to anyone coming to either Mohammad, or the myriad other projects cellist Veliotis has been involved with for at least a decade, for the first time. The joy is in the swooping, soaring melodic lines the trio return to every so often, their unison lines rising like thermal columns carrying the ghost-tones of Palestrina. Despite the occasional gliding, melismatic moments, and ecstatic peaks, Spiriti is shot through with a saturnian vibe that pervades Veliotis’ varied collaborations. Veliotis brings the gravitas, but is a nuanced enough improviser to allow the light and airy elements of partners like Klaus Filip to glean through. 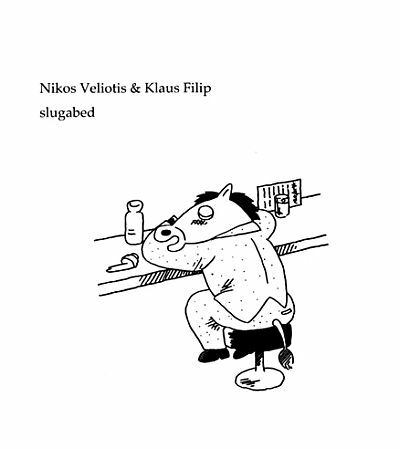 On Slugabed, released in 2010 on Taku Unami’s excellent Hibari imprint, Filip laces the duo’s hour-long piece for computer and cello with silvery unison lines, braiding and unbraiding skeins of lloopp-generated sine waves, while Veliotis holds the center. On Slugabed, as is the case with his duo project Texturizer, and as heard in the series of performances from which Spiriti is culled, Veliotis contributes what Moore calls the binding theme of Saturnine moods – with his string-roots burrowing down into the earth, Veliotis’ playing partners are free to circle, enlace or otherwise limn this massive tonal center from their own palette. In the case of Mohammad, all three musicians trouble the waters at the deepest level; saturnalia unrelieved by the sorts of ascending, slivery lines Filip offers. I can hear Mohammad’s tonal pools as a sort of tonic for our besieged, super-saturated ears, like those geothermal pools weary visitors submerge themselves in. I am trying to tease out the quality in the drone work Veliotis has refined for many years that captures my interest, whatever playing situation he places himself in. It is saturn, lead, gravitas. It is the infusion of his cello’s melancholic rasps and cries into various ensembles that sounds this essential human element – the music of Saturn reaches most of us, as we are all capable of at least brief meditations on what Saturn is saying. Veliotis is hardly the sole voice of saturnine moods [I have been spending time with Mahler’s Song of the Earth, to name one heavy dose of saturnine moods]. He is a current one, an expressive and compelling one, and both Spiriti and Slugabed are bound with the earth-rooted, saturnine spirit that satisfies when nothing else will. 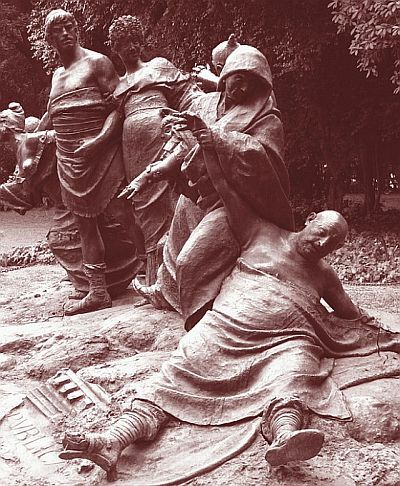 Ikuhiro Yamagata, owns its own link to my preoccupation with the saturnian – when the Romans celebrated the holiday Saturnalia, it was a bacchannal of epic drunkeness. Lugubrious joy. Pictured is an anonymous artist’s depiction of a Saturnalia party that went a little late. This entry was posted in music writing on September 6, 2011 by jessewgoin.